The 2019 version expands its size offerings (a good sign) and, at least in BBCOR, lowers its swing weight. In the past, the bat was built for the heavy hitting elite hitter that wanted a hot out of the wrapper bat with a smooth feel. The swing weight isn’t Jump to the full review. We aren’t the only ones to have information about the 719 Select. Other places, in particular those who sell bats, usually have a boiler plate write up on the specs of a bat. Many of those we reference to make sure we are seeing what we should be. Here are some more references for the 2019 Louisville Slugger 719 Select review. The 2019 version expands its size offerings (a good sign) and, at least in BBCOR, lowers its swing weight. 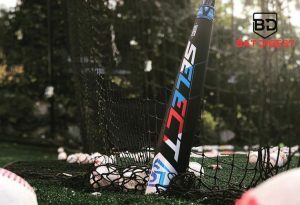 In the past, the bat was built for the heavy hitting elite hitter that wanted a hot out of the wrapper bat with a smooth feel. The swing weight isn’t 619 Solo or 519 Omaha Light. But, in some sizes, it swings similar to the 919 Prime. See our full 718 Select Review for details. The USA 718 Select was the surprise of the year. Slugger absolutely crushed the USA market—almost out of nowhere. The 718 and 618 Solo could not get in stock fast enough. Those two lines haven’t changed much from 2018 to 2019—so expect more of the same in terms of player and parent love. The BBCOR version’s drop in swing weight will help it be more reasonable for an average sized player. However, it still swings in the mid-MOI range. Don’t expect a 618 Solo like swing. As well, like 2018, expect a USA Version of the bat in a drop 5, 8 and 10. Without a doubt, the 718 was the surprise of the 2018 USA Bat class. The 718 felt great, priced out well and came in enough size options for people to swing. It was also helpful that Slugger happened to keep these things in stock (sort of). We think the 2019 USA 718’s will be just as well recieved. They swing nice, feel great off the bat and are hot out the wrapper. This is a high value buy in any of the 3 drops (5, 8 and 10). The 719 and 718 are considerably different in BBCOR. In particular, the swing weight on the 719 is lighter. The 718 was considered one of the heavier swinging bats on the market. The 2019 719 Select should still be considered a heavier swinging bat. It swings 5% heavier than the 619 Solo in the same size (last year it swung closer to 10% heavier). But, compared to the 2018 version the 2019 is noticeably lighter in BBCOR. The USA and USSSA swing weights haven't changed much as they already had the new end cap in 2018. In BBCOR at least there are a few very legit hybrid bat choices. Easton has long focused on a Hybrid bat that has gone through a few name changes over the years. Their 2019 version is referred to as the 13.6 Hybrid. It is, like the 719 Select, a two piece bat built with a big barrel and a smooth smash. The barrel on the 13.6 is slightly larger. DeMarin’s Voodoo Balanced has long been our favorite in the hybrid space. This bat comes in a number of sizes and lengths, more than the 719 or 13.6. It has, as we see it, defined the two piece hybrid space for several years now. We’ve yet to hear a single person say they don’t love the Voodoo Balanced. The Voodoo Insane is more akin to the swing weight of the 719 Select than the balanced version. Both the options above are remarkable choices. And, turns out, so is the 719 Select. Those who have a particular affinity for Slugger or want something with a little more swing weight might lean towards the 719. Otherwise, especially when comparing the DeMarini Voodoo line, we like how the Voodoo in BBCOR is $50 cheaper at the outset. But, considering on the time of year these two bats might be the same price. When the are the same, flip a coin. You won’t be disappointed either way. Which reminds us, the change in 2019 719 BBCOR swing weight is brought upon almost entirely by the redesigned end cap. This lighter end cap pushes the center of mass towards the hands and makes it an easier swing. As well, the bat uses an upgrade connective piece, now called the VCX instead of the Tru3. This is meant as a more consistent connection with better durability but still a great feel at impact. The 719, like the 715, 716 and 718 before it, is a two piece hybrid bat. That is, the handle of the bat is composite while the barrel is aluminum. From the knob to through the VCX connection piece (that ultimately attaches to the barrel) the 719 is exactly like the 919 Prime. no work in and their stiff performance, at least in the 719, guarantee top end pop on barrel-center hits. The connective piece and composite handle allow for a buttery blast in the gap or a more manageable feel on mishits.